Do I need to send my frames? Yes, we need your frames in order to ensure that the lenses are produced properly to our high standards. The only way to ensure that the lenses fit, function, and look great is to have the frame during lens fabrication. 1. Get a new eye exam and send ReplaceALens the resulting prescription. 2. Use your current, valid prescription (must be up-to-date and not expired). 3. We can duplicate the current prescription in your lenses (The lenses must be the same 'Lens Type' that you will be ordering. i.e. single vision, progressive, etc). ***We cannot copy the Rx from Digital HD Lenses. 4. We can copy the prescription off another pair of glasses that you send as long as they are the same 'Lens Type' you're ordering. You will be able to select your Rx Delivery Method during the checkout process. How do I order multiple pairs of lenses? Purchasing multiple pairs of lenses is quick and easy. Plus, you save $10 off your 2nd pair & $5 off each additional pair on ORDERS OVER $100, applied automatically at checkout! Is ordering online as accurate as in a store? At ReplaceALens, ordering eyeglass lenses online produces top-quality lenses equal to or better than what you'll find in most physical optical shops. How? We guide our customers through the process with streamlined product selection, relevant questioning, and simple instructions, leaving little room for error. 1. A valid, accurate prescription. 2. The PD, or pupillary distance, which tells us where to place the optical center of the lens horizontally. We can read this off your current pair or you must get it professionally measured. 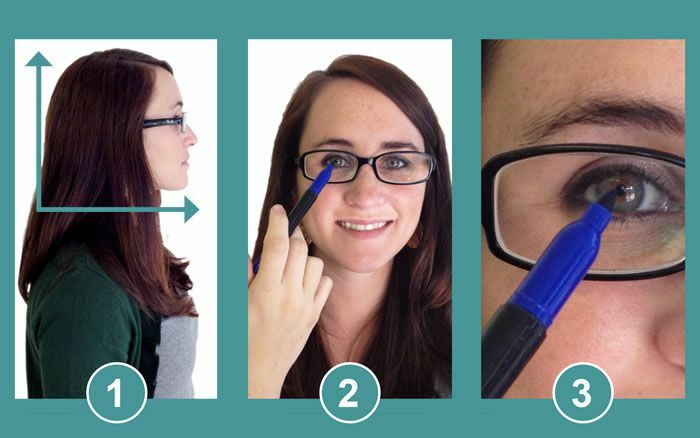 If you are not purchasing PROGRESSIVE LENSES, you can have someone take a picture of you from 5 feet away, with a level head, while wearing the glasses you are sending in. You can email this to info@ReplaceALens.com with your name and contact information in lieu of a PD measurement. Two of the three necessary measurements are done professionally, and the pupil height is very easy to mark. With our streamlined process and a valid Doctor's Rx, we have eliminated virtually all error involved in lens measurements. The last factor is in regard to the frame alignment. Whenever new lenses are inserted into a frame, there is a likelihood that the frame will change its adjustment. We take note of the adjustment when the frame arrives to ensure that standard alignment is preserved throughout the process. After over 200,000 pairs served, we can say (and so can our customers) that our process yields the best results. Plus, if you ever need further assistance, our ABO Certified Opticians and Customer Service Managers are here to help until you are satisfied. Click here for more. What is a PD & how can I get mine? The PD, or pupillary distance is the distance between your pupils in millimeters. Your PD is necessary to accurately fit your lenses to your frame so that you can see clearly. 4. Call the store where you last had a pair of eyeglasses made (they should have it on file). 5. If you are not purchasing PROGRESSIVE LENSES, you can have someone take a picture of you from 5 feet away, with a level head, while wearing the glasses you are sending in. You can email this to info@ReplaceALens.com with your name and contact information in lieu of a PD measurement. 1. We are a full-service optical laboratory. We grind & cut eyeglass lenses, apply coatings, and fit the lenses to the frame all on site, so you save time and money. 2. We avoid the high overhead of traditional eyeglass retail locations. 3. We perform hundreds of lens replacements a week, which allows us to buy products in bulk and pass the savings on to you. After we receive your glasses, processing takes an average of 5-10 business days (M-F). Your order will then be shipped back to you via the selected shipping method. We do our best to complete every order as quickly as possible. We ensure the lenses are technically and cosmetically perfect prior to shipping. Drilled rimless, high-wrap frames, and mirror coatings may take additional processing time.